This is a 1946 Chevrolet 1/2 ton short bed pick up. It has undergone a body off restoration, with a rebuilt drivetrain, and suspension. Engine is a rebuilt 216 cu in six cylinder engine. . Paint is excellent, and chrome, has all been re-done. This is a rare truck with a super nice rust free body and undercarriage. We added a new set of correct wide whitewall tires and a new set of correct hubcaps. It runs and drives excellent. 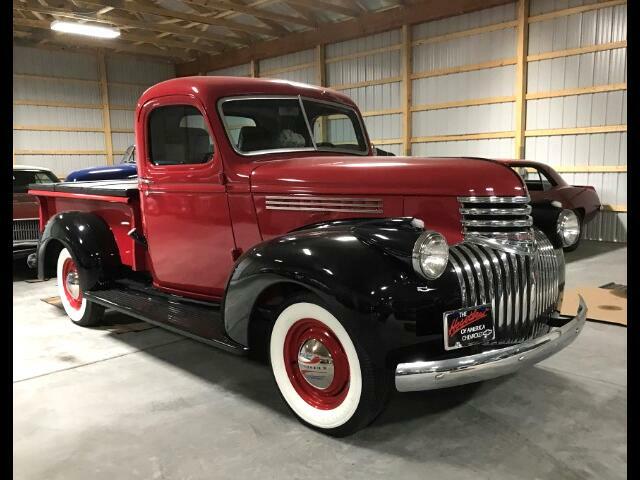 This is listed as a 3100 pick up, (meaning 1/2 ton, and I know this is not correct, but the websites don't have a provision for the model on a 1941-1946 pick up. Message: Thought you might be interested in this 1946 Chevrolet 3100.